Ater the weekend at the beach resort last month with some of Tawn’s high school friends and their young children, the mothers decided to enroll their children in swimming lessons. The pool is not far from our neighborhood, so once a week I take a break from my work and ride over to encouage the little ones as they learn to swim. 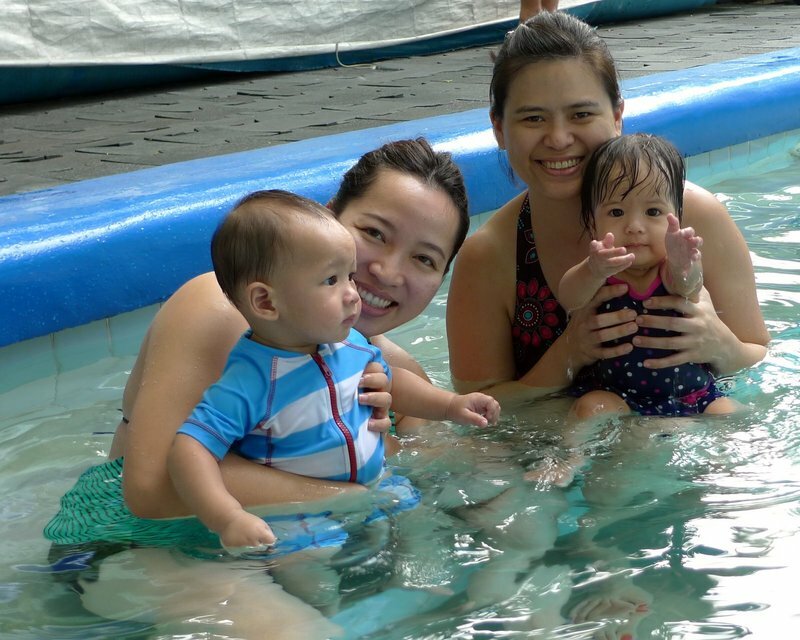 The two youngest ones, Kiri (with his mother, Tao) and Jaeda (with her mother, Saa), both enjoy the water but Jaeda seems a bit more ready for swim lessons. Even after a half-dozen of them, Kiri doesn’t seem to enjoy any activity that gets his face wet. This entry was posted in Uncategorized and tagged friends, Lessons, Swim, swimming by christao408. Bookmark the permalink. Looks like Jaeda was inviting you into the pool or asking for a lift out! hehe I can relate to Kiri. I feel the same way. @CurryPuffy – Swimming diapers help to prevent those problems, actually. @murisopsis – I was holding her before she got in the water and she kept touching my goatee. I think once she got in the water, she still wanted to touch it. @ElusiveWords – Yeah, Kiri is a very cute child. Both of them are. When I was 6 or 7, my mother took me and my younger sister to swimming lessons. The first summer, my sister sat on the side and cried through the whole lesson — the next year, you couldn’t get her out of the water without tears! 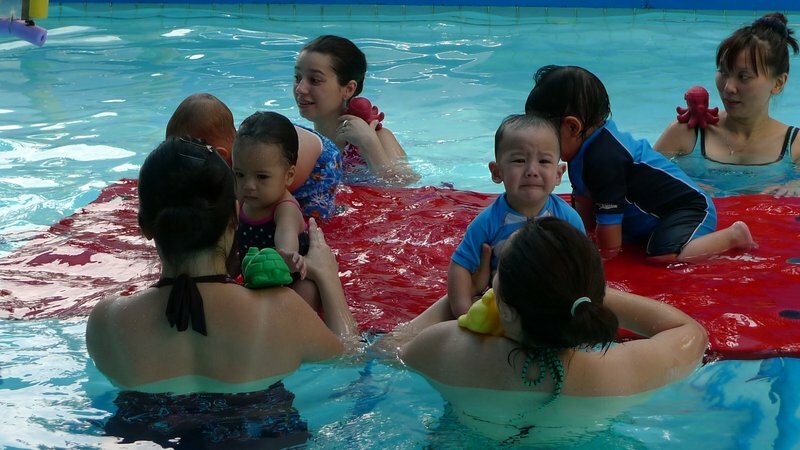 aww… that reminds me of me when i was a little kid… i never really enjoyed swimming lessons. i think i figured out a part of the reason for that much later on… when in water, i don’t float, i sink! The kids are so adorable! I’m planning to enroll my twins for swimming lessons next summer too. Thank you everyone for your comments! @Fatcat723 – @kunhuo42 – Yes, it seems that some of us are blessed with a greater capacity for natural flotation. LOL@Inciteful – It really does make for a nice 60-minute break to my workday. @icapillas – @npr32486 – Oh, the lessons are most definitely worth it. Interestingly, despite there being so much water in this country (rivers, lakes, ocean, canals, etc. ), relatively few children learn to swim and drowning deaths are quite high. I may be biased since my grandmother taught swimming lessons, but every child should learn to swim. @Devilzgaysianboi – It’s funny, but every time I look at the picture of Kiri crying, some paternal instinct rises in me and my eyes start to tear up. @slmret – @Ikwa – That’s so true – they’ll both eventually enjoy the water so much that they won’t want to get out. But they’re not quite there yet! @iskrak – @Sinful_Sundae – Yeah, they really are cute. Thanks for the nice comments. awwww. you should have jumped in and walked with him on your shoulders. He would have liked that. Poor baby.Davis and Andrew were like that too. Now both of them love the pool. RYC: Thank you for the kind comment on my post Chris. You know me well. @ZSA_MD – The first time I went to the lesson, it wasn’t clear if I was going to be participating or just watching. In the end, I didn’t need my swim trunks so haven’t brought them since. In this case, I’m sure I would have been Kiri’s hero if I had jumped in to get him, and would have been the target of his mother’s ire… “What are we spending this money for! ?” =D@aPieceOfTheSky – Yes, she’s a cutie. Right before getting into the pool I was holding her and she likes to touch my goatee and grab the hair on my arms. So I think she was expecting me to come over for some more. Either that or she wanted to hold the camera. Ahhh, loved seeing these photos. I’d have loved to have been there in the pool too. I should’ve done this with Val “murisopsis” when she was a baby. I loved the water but she and her dad did NOT. Neither one of them very buoyant whereas I was like a cork! how did you manage to resist the little one’s silent please for help? I probably would’ve cracked! @AzureRecollections – Well, I wasn’t dressed to jump into the pool, otherwise I would have. However, as soon as class ended, I snatched him out of his mother’s arms. @Gma_Joyce – In the back of my mind, I always assumed that all children liked the water. Perhaps that’s just because my sister and I both did.